Depending on placement of bones in the arm and other structures, you can divide the human arm into two major parts. These are: the upper arm and the forearm. In total, the bones in the arm are three in total. The bone in the upper arm is the humerus while ulna and radius make up the forearm. You can read more detail about these important bones in the arm from the following description and diagram. You can understand the structure and function of humerus, one of the major bones in the arm, through the following facts. Humerus is the largest of the bones in the arm. It is a long bone since its length is greater as compared to its width. It is the only bone making up the upper arm. Being a homophone with the word humorous, the humerus bone has also got an interesting name, i.e. the funny bone. The bone supports most of the major functions of the arm including lifting and throwing. The writing movement of the hands is also due to the presence and working of the humerus. Three bones in the fetus develop into the humerus bone in adults. The bone keeps growing and elongating throughout the childhood years till an individual reaches puberty. The humerus extends from the shoulder up to the elbow. It attaches the arm to the scapula – more commonly, the shoulder blade – at the back. While at the front, it has a connection with the clavicle – more commonly, the collar bone. A number of powerful and important muscles help in manipulating the upper arm at the scapula as well as the forearm at the elbow. These important muscles are attached to the humerus bone. The head of humerus is a smooth and spherical structure which forms at the proximal end of the bone. It is a part of the ball and socket shoulder joint – the head of the humerus being the ball and the cavity of the scapula being the socket. Circumduction is a type of movement which the humerus bone is capable of carrying out. It involves moving in a complete circle which becomes possible by the round head of humerus. Neck of the humerus forms as the round head of the bone narrows down. It narrows down further and becomes the body of humerus as it joins the elbow. Capitulum and trochlea are two joint forming processes which you can see at the distal end of humerus. 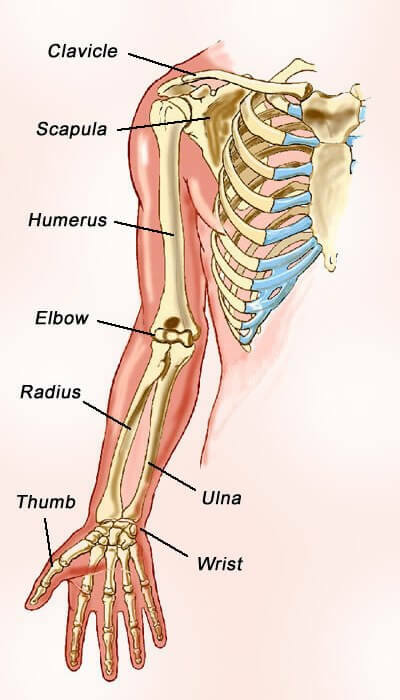 At the elbow, the humerus develops connection with the ulna bone of the forearm. Here ulna is another of the three bones in the arm. A large part of the brachial artery, bringing oxygenated blood from the lungs, travels through the humerus before it subdivides into branches at the elbow and below. In this way humerus enjoys an important place among the bones in the arm. Ulna is one of the three bones in the arm. Meanwhile, it is also one of the two bones in the forearm. The following facts describe the structure and function of this important bone. Among the two bones in the forearm, the ulna is the longer and larger one. It connects the forearm to the upper arm at the elbow. At elbow, all the bones in the arm come into contact with one another. The ulna belongs to the category of long bones owing to its long, narrow structure. A number of movements of the arm, the wrist and the hands occur due to the support of the muscles which are attached to the ulna. At the proximal end, the bone forms elbow joint with the humerus bone in the upper arm. The tip of the elbow, the olecranon, is formed by the ulna as it extends beyond the humerus. The ulna narrows down at its distal end as it moves away from the elbow towards the wrist. The bone is an important attachment site for a number of muscles of the upper as well as lower arm. The cavity at the center of the bone contains yellow bone marrow. It is a soft and greasy substance which stores fats and triglycerides as energy reserves for the body. The ulna bone also forms the three important joints in the arm. Flexion (bending) and extension (straightening) are two movements of the elbow joint which are possible owing to the crescent shape of the top of the ulna bone at the joint. The shorter of the two bones in the forearm is the radius. The following facts provide detailed information about the structure and functionality of this bone. It also enjoys an important place among other bones in the arm. Radius appears at the lateral part of the forearm. The bone has alignment with the thumb of the hand. You need to place it in the category of long bones. Its growth and elongation continues from birth till adolescence. Rotation of the radius bone lets the hand pivot at its wrist. Many important movements of the upper limb occur due to a number of muscles which have origins as well as insertions at the radius bone. Although it is shorter in length than the ulna bone, the radius continues to widen as it extends down the forearm. Eventually, at the wrist, the radius bone is wider than its counterpart in the forearm. Flexing of the forearm and its pivoting at the elbow joint gets support from the head of the radius bone. The bone serves as an anchoring point for several important muscles of the upper arm as well as the forearm. Although it appears to be straight in X-rays, the shaft of the radius makes a slight curve as in the case of other long bones of the body. The cavity inside the radius bone contains yellow bone marrow where adipose tissue is present. This tissue stores fats and triglycerides which serve as the body’s energy reserves. Red bone marrow tissue in the radius synthesizes red blood cells. These three important bones in the arm make up the structure of the arm and contribute towards its movement. In addition, the bone marrow of these bones in the arm is also house for the reserves of energy and produces blood cells. Therefore, humerus, radius and ulna are three very important bones in the arm, in particular, and in the human body, in general.